MedStar Georgetown University Hospital is a not-for-profit, acute-care teaching and research hospital licensed for 609 beds located in Northwest Washington, D.C. Founded in the Jesuit principle of cura personalis—caring for the whole person—MedStar Georgetown is committed to offering a variety of innovative diagnostic and treatment options within a trusting and compassionate environment. MedStar Georgetown’s centers of excellence include neurosciences, transplant, cancer and gastroenterology. Along with Magnet® nurses, internationally recognized physicians, advanced research and cutting-edge technologies, MedStar Georgetown’s health care professionals have a reputation for medical excellence and leadership. MedStar Georgetown was recently ranked in the national Vizient database as #1 in the nation for the prevention of central line-acquired bloodstream infections (CLABSI) and the incidence of iatrogenic pneumothorax (when a patient suffers a lung injury due to medical care in the hospital). These #1 rankings are based on recently released data from the 4th quarter of 2017. Vizient is a national database that contains multiple patient care measures and is populated by hundreds of participating hospitals throughout the country. MedStar Georgetown was named as one of the 2018 “100 Great Hospitals in America” by Becker's Healthcare. This honor recognizes MGUH for its excellence in clinical care, patient outcomes, and staff and physician satisfaction. Additionally, this honor recognizes MGUH for having achieved advanced accreditation and certification in several specialties. MedStar Georgetown University Hospital becomes the first center in the Washington, D.C. metropolitan area to start treating patients with proton therapy. MGUH became the first hospital in the United States to earn certification in Patient Blood Management from the Joint Commission and the AABB (formerly known as the American Association of Blood Banks). The MGUH Hyperbaric Medicine Program became the first in D.C. to earn accreditation from the Undersea and Hyperbaric Medical Society. MGUH was redesignated as a Huntington’s Disease Center of Excellence by the Huntington’s Disease Society of America. MedStar Georgetown University Hospital earned The Joint Commission’s Gold Seal of Approval® and the American Heart Association/American Stroke Association’s Heart-Check mark for Advanced Certification for Comprehensive Stroke Centers. MedStar Georgetown is one of an elite group of healthcare organizations in the United States to have earned this certification in highly-specialized stroke care. MedStar Georgetown’s Stem Cell Transplant and Cellular Immunotherapy Program earned internationally-recognized accreditation by the Foundation for the Accreditation of Cellular Therapy (FACT) to now provide allogeneic and autologous transplantation. In addition, the program earned accreditation to provide cell-based immunotherapies, such as the rapidly developing treatments using autologous CAR T-cells in the treatment of lymphoma, leukemia, and multiple myeloma. MedStar Georgetown has the only FACT-accredited adult stem cell and cellular immunotherapy program in the metropolitan Washington, D.C. area. MGUH was designated by NICHE (Nurses Improving Care for Healthsystem Elders), the premiere nurse-driven mechanism through which hospitals foster improved care of older patients, as a Level 3 Senior Friendly NICHE hospital for the Hospital’s focus on geriatric patient care. The Huntington’s Disease Society of America and its Center Programs and Education Advisory Committee designated MedStar Georgetown’s Huntington’s Disease clinic as a Level 2 HDSA Center of Excellence. MedStar Georgetown’s Women’s Health Physical Therapy Residency Program received accreditation from the American Board of Physical Therapy Resident and Fellowship Education. MGUH is only one of eight accredited programs in the United States. The MGUH Bone Marrow and Stem Cell Transplant Program earned accreditation from the Foundation of the Accreditation of Cellular Therapy, the field’s world-wide credentialing organization. At the time, MGUH was the first in D.C. to earn this accreditation. The MGUH Comprehensive Epilepsy Center receives Level 4 re-designation from the National Association of Epilepsy Centers, which is the highest level of designation an epilepsy center can receive. The National Pancreas Foundation Center designated MGUH as an approved NPF center. MGUH is one of 30 centers in the United States and the only facility in the Washington, D.C. area to earn this designation. MedStar Georgetown’s Comprehensive Epilepsy Center received Level 4 redesignation from the Na¬tional Association of Epilepsy Centers. This is the highest level of patient care that an epilepsy center can be awarded. The Pathology Laboratory earned reaccreditation from The College of American Pathologists (CAP), who recognized the lab for its delivery of safe, high quality patient care and compliance necessary to maintain the accuracy of diagnoses and test results. MGUH earns third consecutive Magnet designation by the American Nurses Credentialing Center. MGUH is one of only 66 hospitals in the country that have achieved a third consecutive Magnet designation. MGUH was re-certified as a Primary Stroke Center by Joint Commission. The certification recognizes the Hospital’s exceptional efforts to foster better outcomes for stroke care. MGUH Comprehensive Epilepsy Center received Level 4 re-designation by the National Association of Epilepsy Centers. This is the highest level of designation an epilepsy center can be awarded. Georgetown Lombardi Comprehensive Cancer Center was re-designated as a Comprehensive Cancer Center by the National Cancer Institute. 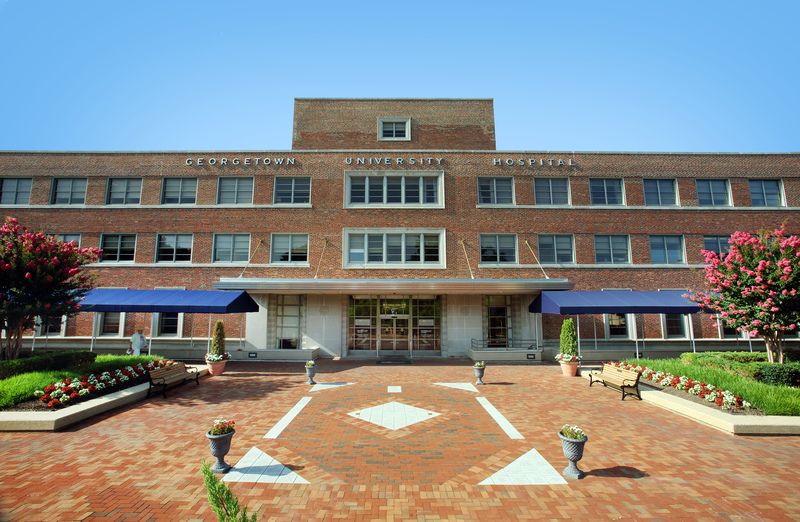 Georgetown Lombardi has maintained this designation for the last 21 years and is one of only 41 (49 as of 2018) designated comprehensive cancer centers in the United States.